Material Deprivation in Europe: Which Expenditures are Curtailed First? 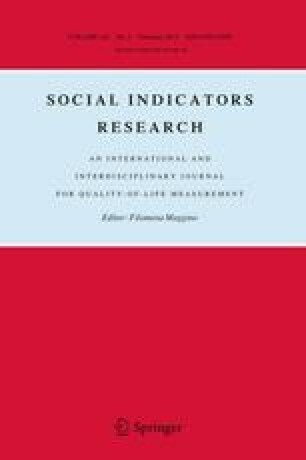 This paper takes a close look at material deprivation in 27 European Union countries. Its main goal is to explore which expenditures individuals/households curtail first when facing economic difficulties. Two methodologies are applied: item response theory, a psychometric method also known as latent trait analysis, and the concept of deprivation sequence which is an extension of the notion of “order of acquisition of durable goods”. Both approaches show similar results when applied to EU Statistics on Income and Living Conditions material deprivation data. Overall, the order of curtailment found in the data does not differ substantially between EU Member states. Looking at within country variations, our analysis shows that the order of curtailment of the country as a whole is very similar to that of the various population subgroups. This is a co-authored paper, every author has contributed equally to all aspects of the final article. A previous version of this paper was presented in a session on the measurement of multidimensional deprivation at the annual meeting of the Southern Economic Association in Tampa, Florida, on November 24, 2013. Jacques Silber thanks those who participated in this session for their very useful comments. Marco Pomati is funded by a 3-year ESRC PhD Grant (ESRC Grant 1052611). and Tables 1, 2, 3, 4, 5, 6 and 7. Council of the European Union (2011). Opinion of the Social Protection Committee on: Reinvigorating the social OMC in the context of the Europe 2020 Strategy, Doc. 10405/11, Brussels: European Council. http://register.consilium.europa.eu/pdf/en/11/st10/st10405.en11.pdf.